The Dozuki Z saw is a great example of the versatile Japanese back saw great at dovetails, tenons, cross cuts, and case work. As a hand tool woodworker or a hybrid woodworker looking for a little more finesse or a maybe some extra love into a project you have a few options for cutting fine joinery. For a back saw you can cut on the push stroke with either a pistol grip or an English grip or you can cut on the pull stroke in the Japanese style. I have used several of each over the years making joinery over the years and they each have their benefits. 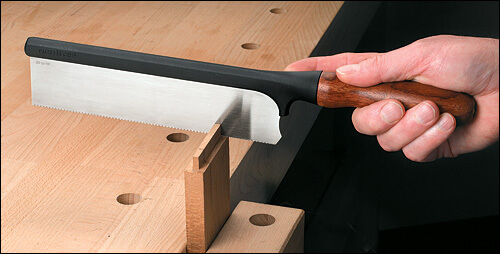 Lee Valley Tool’s Veritas Gen’t saw is a classic small English style back saw, perfect for dovetails. Lee Valley Tool’s Pax Rip Pattern Dovetail saw is a great example of a Western backsaw, great for case and tenon work. The American/western pistol grip back saw is great at repeatable square cuts. If you live in the united states this is probably the saw you are most familiar with. The precision layout of the classic grip designs allows you to squeeze this finger for a more aggressive cut and that finger to square up your blade. This American backsaw is great for cutting accurately, quickly, and near perfectly square and plum. The grip naturally puts your body into an effective and efficient cutting position and when your body learns this position the cutting motion is translatable across all manner of classic american cross-cut and rip-cut saws which are widely available in most Western and European countries and can be easily sharpened and restored. The disadvantage as with all western saws is the cutting motion is on the push stroke rather than the pull, this means the blade is under stress rather than tension during the cut which can cause the blade to deflect in hardwoods or a particularly aggressive gorilla at the wheel (layer 8 error.) I have also found that when dull blades (who EVER lets their blades go dull?) are under stress they tends to chatter and widen your kerf more than you probably intended. The last thing, and this is a bit blasphemous, while the consistency of a pistol grip makes the best plum cuts of any saw out there, it also forces you to rotate your whole upper body to properly make an angled cut. Many skilled sawyers do this with ease, but to me the more moving parts in a cutting motion, the less accurate the cut. The American back saw is my choice for tenons and cross cutting by hand (which I rarely do anymore,) and most of the classic saws that are easily attainable in the US and Europe have the advantage of near infinite resharpenability. The Dozuki Z Saw is a versatile and precise backsaw capable of almost any dovetail, cross-cut, tenon, or case work you can throw at it. Finally the Japanese saws, the Dozuki Z saw we are focusing on, being my katana of choice at the moment is a fine and inexpensive saw with widely available replacement blades. The Japanese backsaw has one advantage that neither western saw has, the cut is on the pull stroke rather than the push. This may sound like a minor difference, but think about the difference is strength of a piece of paper when you pull it from both sides vs. pushing it from both sides. Cutting while the blade is under tension rather than stress allows the saw to more naturally cut straight allowing for much thinner steel and thus a smaller kerf and less set in the teeth. The other advantage is the Japanese style saw is the long straight handle that allows for multiple hand positions; grip the handle close to the blade to track the blade in a scored or drawn line with great control and accuracy, hold it lightly further back on the handle to allow the blade to naturally follow the kerf you have already started. On the Dozuki, like most of the japanese saws I have used, the the handle is slightly rectangular, unlike the english “The Gentleman” saw (pardon my How I Met Your Mother reference.) This allows your hand to have a more repeatable grip and more consistent cuts, pardon all of the gentleman sawyers out there that can prove me wrong. 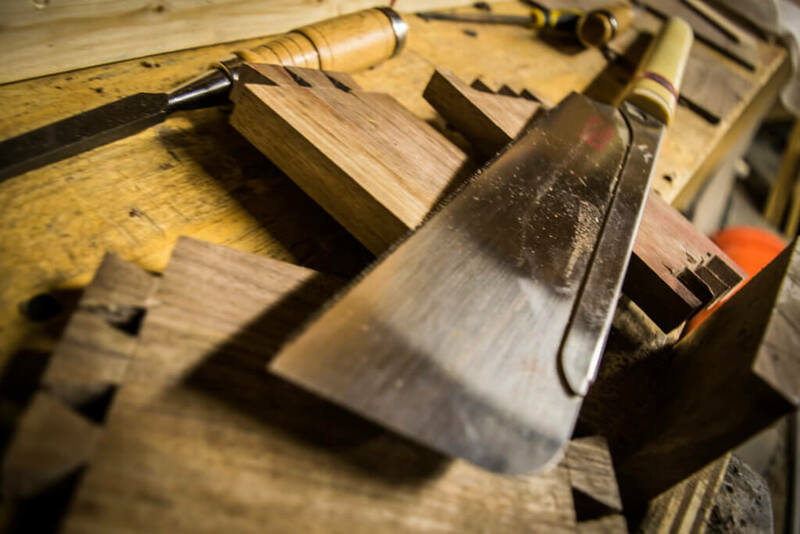 This means while the saw is a ninja on dovetails (pun intended) and angle cuts, it is also effective at consistent square and plum cross-cuts (although not as repeatable as western backsaws.) If you are going to have one back saw in your arsenal, this is the one. 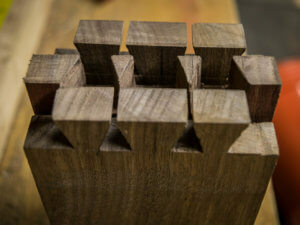 Riven american black walnut dovetails cut precisely with the Dozuki Z saw. At the end of the day the Dozuki Z backsaw is a great saw to have in your tool chest, it is versatile, laser accurate, and inexpensive. If you haven’t had success with the other European saws, give a Japanese saw a chance, it may open your eyes. With the thinner saw kerf the stroke is near effortless, and the pull stroke can correct for some of your hamfistedness. I won’t say it is the only saw I will ever use, but at least for now it is the easiest saw I have ever used to master, and it didn’t break the bank. Talk to me again after I bust the teeth off of a few blades and have to replace them, I might be singing a different tune. Thanks Rick. That’s a great write up. I agree with your take on these saw. I use a gent and a british backsaw, my dozuki was cheap and the teeth didn’t last, but I may get another nicer one in the future and have another go. It was fun to use, easy to cut with, but never tried dovetails with it. I wonder if the cut starting on the opposite, blind side ever becomes an issue. Ya I agree, I have lost a few teeth already but it still cuts fine. I wish I could afford one of the nicer Japanese saws, the thin kerf is awesome but buying replacement blades every few years is less than desirable. My guess is that he sees your post as I do. But, I find this article and your web page, very tasteful. Why this isn’t spam: when I went to your web site, I didn’t get my computer locked up with a 800 number to call. Thanks @Desert_Woodworker, I’ll keep them coming then. Maybe because this is really a instructional blog article and not a review on an actual dozuki saw. Although, well written, this article is comparing and contrasting the 3 types of saws. I don’t see any actual review on a specific brand of dozuki and how it worked for you in your work or how good or bad it’s results were compared to other dozukis. So, no it is not spam in any sense of the word, just miss-categorized imo. I struggled with the lack of review in this review, too. It’s an article that concludes dozuki saws rock, so blog is the better name vs. review. Good write-up, good pictures, and at least the content was actually here vs. just posting a link. I’ve never tried a japanese pull saw, where ”...the cut is on the pull stroke rather than the pull… while the blade is under tension rather than stress allow[ing] the saw to more naturally cut straight…” I don’t have a problem cutting straight lines (it’s technique and proper sharpening) and the differences in sawplates that are .015″ vs. .020” are lost on me. It’s the waste side I’m cutting anyway. All that said, good post and I enjoyed reading it. Thanks for the feedback, I will take that into consideration in future articles. i am always trying to get better. No typo. The brackets show where I adjusted the quote to fit where I was applying it. There was the letter “s”, I deleted it and added “ing”. That the way I think it’s done, but if not, I tried. Great article. Lots to think about. I never really liked the “hand feel” of the Japanese saws. I’ve tried putting self-sticking bandage tape on the handle to reduce slip. I keep thinking that a more oval, taller shaped handle might help me some. Then again, I use the improper “choked up” grip, not the proper mid-handle grip like it is supposed to be used. -- Expert at turning Big pieces of Wood into Little pieces of Wood! agreed. great info, but not a review. not spam, but likely a paid post.